This means Ann Margret isn't coming. Many people say the boot camp scenes at the beginning of the film are the strongest. My intention? Mix them into the Vietnam scenes. Hopefully, it gives the film a fresh perspective, as boot camp is now told in flashback form, with the appropriate boot camp scenes following Pyle's downfall used. Other material has been excised. No one else had tried it, so i thought why not? Niet. Nadda. Zip. Zilch. None. As I was going through, i was viewing the boot camp scenes, and tried to match them with the Vietnam scenes, so it was told in a parallel storyline.....which probably hasn't worked. Was worth a try all the same, though. Intercut between Boot Camp and Vietnam. Cut most of the boot camp scenes which concentrated on other marines, and not on either Joker or Pyle, so the film is more about them, than a whole couple of squads. Boot camp scenes in B&W. First off, my only real criticism of this edit is the black and white filter on the flashbacks (oh, and the omission of certain scenes.) Now, there's nothing wrong with B&W, but it just seems wholly unnecessary in this case. I just can't see anyone watching a fan edit before having seen the original, and even if they did, I just have my doubts that there would be any confusion over which scenes preceded the others chronologically, provided they also forgot to read what was changed in the edit. Unlikely, in other words. Other than that, the edit is fine; just about exactly what was advertised. What it mainly managed to do was show me that I was incorrect in thinking the second portion of the film is on par with the first. In my now majority, then minority, opinion, it's not. In fact, it slightly lowered my opinion of the film. 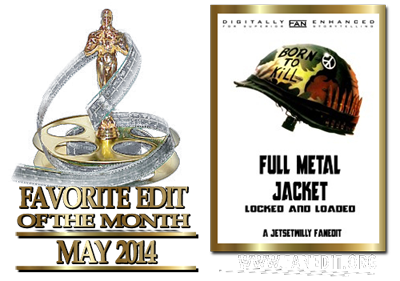 I still like Full Metal Jacket though, and I like this edit. I must just be lucky because I've watched three fan edits in a row that I really enjoyed. Fan edits at their best can either make an entirely new movie out of an old movie or reintroduce you to a movie that you have seen many many times before. Full Metal Jacket, for me, is one of those movies I have seen many many times. I can close my eyes and walk through Full Metal Jacket line by line. Fan editing when done well can make an old movie new again. 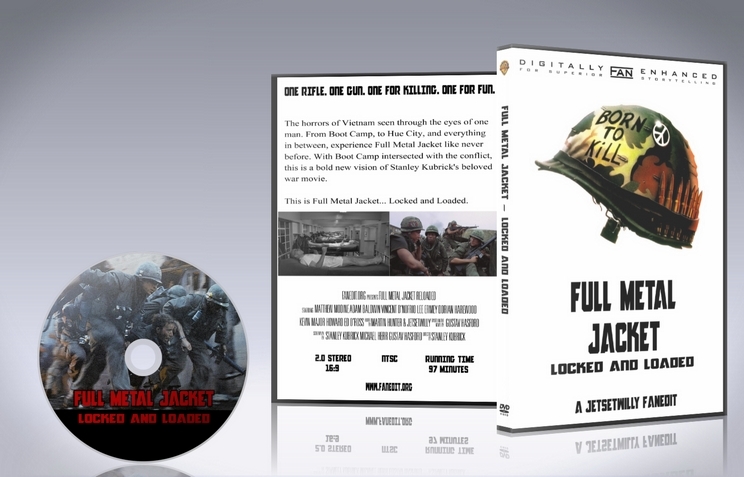 Full Metal Jacket - Locked & Loaded has done just that for me. It's been probably two years since I've watched my DVD copy of FMJ. As I said I can see this movie in my minds eye so it's not like I forgot anything. JetSetWilly accomplished what an good fan edit sets out to do. He made an old movie new again. I haven't enjoyed FMJ this much in a long time. I appreciate the cuts made and I understand why you decided to cut what you did. I also enjoyed the deeper impression of isolation the edits gave to Pyle. The Kubrick cut always just left the impression that Pyle wasn't isolated he was just a broken third wheel. The transition of scenes wasn't always smooth but that really didn't matter as much as the overall story being being presented here. I thoroughly enjoyed watching this edit. I like Full Metal Jacket, but to me it was always essentially two movies. The first movie being the basic training and Pyle's arc. The second movie being Joker in Vietnam. JSW came up with a unique way to change the narrative and I think it works. The title fonts worked well (as for as I can tell it's the same font as the title cards in the theatrical version). However the fonts used to indicated place and time (i.e. Da Nang 1968) looked to me a little tacky/amateurish, this is just my opinion though. The first dissolve to the flashback of the introduction of the Drill Instructor was a bit abrupt IMO, however the subsequent dissolves throughout the remainder of the edit were excellent! The audio work, for the most part the audio editing was spot on. And the inclusion of "Satisfaction" worked well. The only thing I noticed, worth pointing out, is around the 37:08 mark, during the black screen, you can faintly hear the sound of a trumpet (remnants of another seen i'm assuming). I didn't notice any other problems though. The black and white was also well executed. Sometimes people change stuff to black and white and it ends up looking crappy, this was definitely not the case here. Lastly, one subjective thing regarding the narrative. This has nothing to do with the technical aspects of the edit, but I would have liked to have seen one other flashback of Pyle's transformation before the last flashback culminating in the murder/suicide. Overall this edit was prettay, prettay, prettay good. While it doesn't improve on the original, it is definitely an alternate version that is worth seeing. I've always enjoyed the first half of the movie the most. The second half is good, but not as good. Telling the second half in its own right works extremely well. The focus of the movie is squarely on Joker now, with the flashbacks to the first half showing us only what we need to know about how Joker was shaped by his experience at Parris and with Pyle. I thought more material could have been included in that regard. In this edit, it doesn't seem that Joker became Pyle's squad leader, which is an interesting change. Without Hartman's speech about giving the rifle a girl's name, the closing voiceover is robbed of impact and sounds quite out of place. A few of the transitions were a touch too long of blank screen. Overall, a very interesting edit. 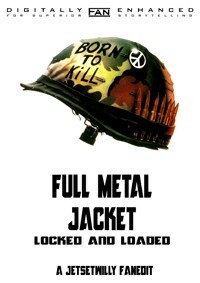 Kubrick is my all-time favorite director and I absolutely love Full Metal Jacket how it is. JetSetWilly's idea for this edit has intrigued me since he first started working on it. I've watched (I think) every iteration JSW made and helped him out along the way. This is an excellent example of re-editing a great movie to see what could have been. The dual story lines are marvelous told this way, intercutting boot camp with war. The editor chose the exact right moments to cut back and forth without having one segment drag on. The editing was smooth and this makes for a great viewing! It's not better than the original, but it's not trying to be. Highly recommended.